Today is International Women’s Day – a time to to mark the economic, political and social achievements of women, and to remember the struggles of women worldwide. It’s as good a time as any for feminists to think about the feminist movement and where it is heading. In the west, we include the many and varied issues faced by third-world women in our list of reasons why we still need feminism. But we’re not always as good at accepting diversity among western women. Let’s take last year’s winners of the Nobel Peace Prize as an example. Theirs are the kind of struggles and achievements that we should celebrate on a day like this. 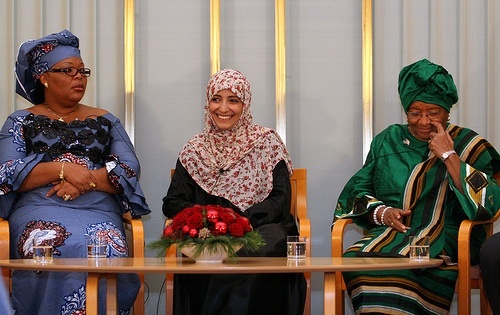 The award was given to three women from Africa and the Arab world for their peaceful struggle for women’s safety and women’s rights. One of them, Tawakkol Karman, is a human rights activist in Yemen. She is also a Muslim. The other two winners are from Liberia – president Ellen Johnson Sirleaf and peace activist Leymah Gbowee, who brought Christian and Muslim women together to protest and pray for peace. As another example, consider a movement in Argentina: the Mothers and Grandmothers of the Plaza de Mayo. These women’s children “disappeared” during the military dictatorship of the 1970s and 80s. In the search for their abducted children, they engaged in public protests to pressure their government. Authors studying the movement found that these women were more interested in preserving life than challenging the gendered division of labour. The work of these African, Arab and Argentinian activists is pro-women, pro-justice and pro-equality, whether or not they would identify as feminists themselves. And it’s this kind of work that often gets invoked when we’re challenged about whether feminism is still relevant. Yes, we respond, feminism is still relevant in Australia. It’s great that we have a female prime minister, but women are still underrepresented in parliament. And feminism is still relevant because of global inequalities: think about the struggles of women in developing countries. It’s “beholden on women who do have equal rights” to fight for women in non-Western countries who don’t, according to one feminist musician performing at a Melbourne cabaret event tonight hosted by the International Women’s Development Agency. But it’s an uncomfortable truth that those working to advance women’s interests in other countries don’t always take approaches that we agree with. If the western feminist movement wants to include these struggles, if it wants to recognise them and argue for their importance, then it has a responsibility to be more inclusive of Australian women with diverse views. Now, the feminist movement needs to stand for something. I’m not suggesting we should start letting girlfriend-basher Chris Brown into the club, should he care to join. At its core, the feminist movement works for the good of women and girls. But different women have vastly different views about what that might look like and how it might be achieved. For Leymah Gbowee, it was achieved partially through prayer and interfaith dialogue. For the Grandmothers of the Plaza de Mayo, it was about prioritising the preservation of life over debates about the division of labor. To many Australian feminists, these attitudes may seem absurd or plain wrong. But then, there are also many Australian women who want equality for their gender but get rebuffed by mainstream feminists. Trust me. I was once accused of “dressing like a Christian”. Goodness. Last time I checked, the amount of skin I displayed was no-one’s choice but my own. And my faith doesn’t somehow stop me from being furious when the subjects of sexual assault get accused of “asking for it” because of their hemlines. I’ve met smart, independent women who think they don’t get to call themselves feminists because they would like to be married one day. I’ve met several young women who, when asked about their career goals, respond that they’d like to do this and that, but what they’re really keen about is being a mum. At first, I was taken aback by this. I’m immensely grateful to the activists of my mother’s generation and those before who have ensured that I am able to choose a university education and a career. But my choice to study and work and risk waking up one day and realising that like Julia Gillard, I have no fruit in my fruit bowl is just that – a choice. Becoming a mum is rarely seen as a feminist move – quite the opposite. But it doesn’t mean you stop believing women should be able to walk alone safely at night or you quit expecting your partner to help with the housework. In fact, it might even involve explicitly feminist work in the form of raising daughters and sons who value equality. The feminist movement should be robust enough to sustain debates about how best to advance gender equality. It can only be improved by including women with different and creative ideas. It always makes me so sad to hear that some women are not comfortable calling themselves feminists because they would like to be married some day. I also get really concerned when one issue is made central to feminism, like “you can’t be pro-life and call yourself a feminist”. I think the focus of feminism should always be equality. I know that’s broad but I think you make a good point about embracing a diversity of women, and seeing their views about attaining equality is extremely important to feminism. At the same time I think we need to acknowledge the possibility of ‘false consciousness’; how much of what we say and do is really a choice, and how much is steeped within an inherently patriarchal system? I don’t know if we can ever truly separate society from the individual, but it’s worth thinking about. As in, how many of my choices are not entirely my own choices because they are structured/determined/influenced by The Patriarchy? This is a very good point.